"They were deadly on the ground; Now they have wings"
Returning from his most recent deployment, U.S. Army Ranger Cameron Poe and his pregnant wife celebrate the occassion by going to a local bar. As they're leaving, the couple is assaulted by a group of drunks. Poe fights them off, accidentally killing one. He is sent to prison for the man's death, but is released eight years later. Poe is scheduled to fly home to Alabama on a special prison transport plane called the Jailbird, which is ferrying prisoners to a new maximum security prison. Among these prisoners is Cyrus "The Virus" Grissom, who orchestrates a takeover of the plane. Grissom forces the pilots to land in Carson City, where he and the other inmates disguise themselves as guards to pick up more prisoners, including drug lord Francisco Cindino. Grissom also orders one of his men, Pinball, to remove the plane's transponder. He does this, but as he tries to make it back on the plane as it's taking off, Pinball gets caught in the landing gear. Meanwhile, Poe, who is pretending to cooperate with Grissom, manages to get a warning out to the authorities about the takeover. As the plane is flying to Fresno, Poe finds Pinball. He writes Jailbird's destination on the dead prisoner's body and throws him out of the plane. When they land in Frenso, Jailbird gets stuck when it overshoots the runway. As Grissom and the other prisoners work to free the plane, Cindino tries to get away in his private jet. He fails to do so and is killed by Grissom. Police and National Guardsmen storm the airfield and engage the prisoners in a firefight. Grissom and the surviving prisoners escape in Jailbird, but Poe fights them in an attempt to take control of the plane. It crashlands on the Vegas Strip. Poe pursues Grissom through the city and kills him at a construction site. He then reunites with his wife and daughter. 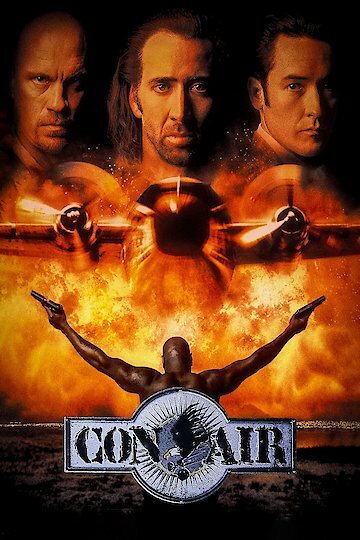 Con Air is currently available to watch and stream, buy on demand at Vudu, FandangoNow, iTunes, YouTube VOD online.